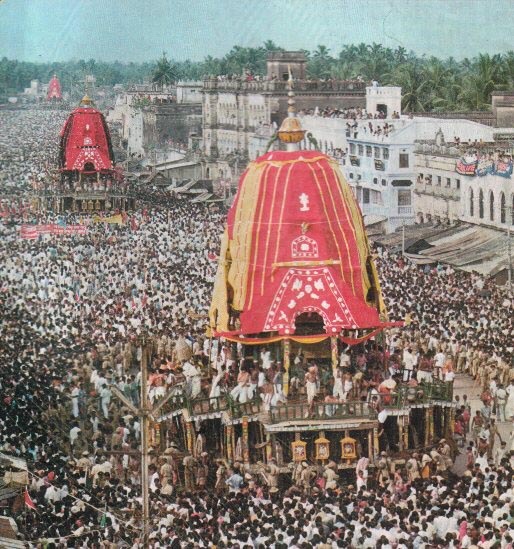 How ancient is the Festival of the Chariots?It's hard to say exacty,but Ratha-yatra is one of the worlds oldest religious festivals. 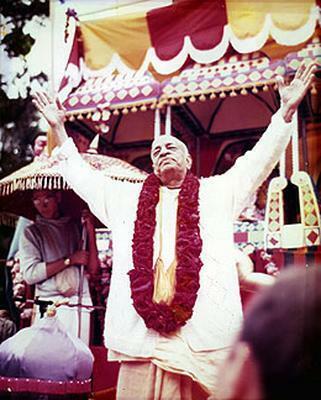 At the 1976 New York Ratha-yatra,His Divine Grace A.C.Bhaktivedanta Swami Prabhupada explained its origins: "Five thousand years ago Krsna,Balarama,and Subhadra visited Kurukestra in Thier chariot on the occasion of a solar eclipse.One king,Indradyumma,then became very anxious to establish a temple of Krsna,Balarama,and Subhadra.Therefore he got a sculptor to carve the Deities. "But there was a contract between the sculptor and the king that the sculptor would work behind closed doors and the king could not disturb him.When many days had passed the king thought,"What is this worker doing? "So he forcibly opened the door,and he saw that the forms were unfinished.But after that the sculptor would not finish carving the Deities.Therefore the king said,'Never Mind;I shall worship this unfinished Deity. 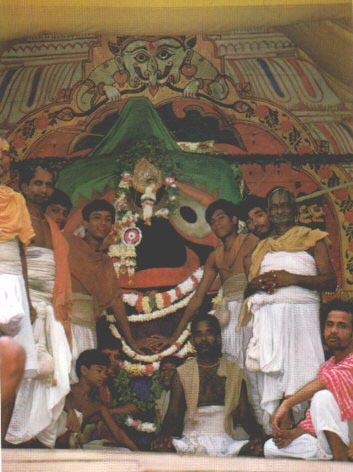 '"So you see Jagannatha in this form because King Indradyumna wanted to worship Him in This form.And the king started the temple of Jagannatha in Orissa,at Puri,It is a very old temple-according to mordern calculation not less than two thousand years old.The Jagannatha Deity is there.So Krsna and Balarama and Subadra went to Kurkesetra for the festival,and at Ratha-yatra we also are observing this festival"(The Talk was on Ratha-yatra day,1976, New York)Until very recently,Ratha-yatha was a strictly Indian celebration.It made its way indirectly into Western culture when the British fist wastched it in Puri and coined the term juggernaut,after the chariots of Jaganatha,to indicate an overwhelming,irressisible force.They felt moved by the immensity of the canopies and wheels,and by the fervor of the devotees'exultant chanting of the holy names of the Lord.However the name Jaganatha does not directly mean what juggernaut means. Align="Right"> Jagan-natha indicates"the Lord of the Universe"-the Lord not just of India and Indians but of the whole universe and all living beings. A Festival of Spiritual Pleasure The Festival of the Chariots gives us a chance to clesnse our hearts and advavance in self realization. Ladies and gentlemen,I thank you very much for coming here and participating in this great movement,known as the Hare Krsna sankirtana movement.This movement was started five hundred years ago by Lord Caitanya Mahaprabhu in India,in the state of West Bengal.His mission was that this Hare Krsna movement,or God consciousness,should be spread all over the world.As many towns and villages as there are on the surface of the globe-He predicted this Hare Krsna movement would be spread to all of them.And his prediction is now being carried out by the International Society For Krishna Consciousness.So we ask you to kindly tahe advantage of this movement.The purpose of this movement is to cleanse the heart.We have created so many problems in our lives simply out of misunderstanding,and this movement is meant for cleansing the misunderstanding from the heart.What is that misunderstanding?The misunderstanding is that we are accepting this material body as the self.We are all living entities,spirit souls,encaged in material bodies,and we are transmigrating from one body to another.There are 8,400,000 species of life,and this human form of life is the greatest opportunity for self-realization.Self-realization means to know,"I am a spirit soul;I am part and parcel of God. 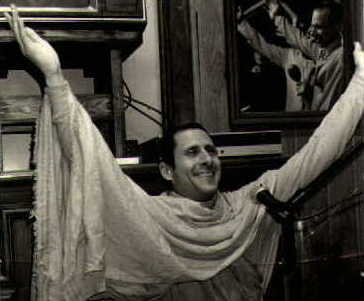 "Some of you may have read the Bhagavad-gita. 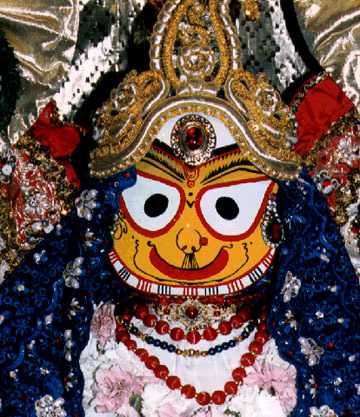 In the Fifteenth Chapter it is said that the living entities are part and parcel of God.God is by nature joyfull--in the Vedanta-sutra* it is that the Supreme Absolute Truth is (anandamayo bhyasat,"by nature joyful. "Therefore,since we are part and parcel of God,our aim of life is joy.Now we are searching after that joyfulness within this material world,but to find it here is not possible. 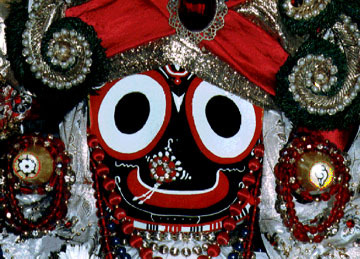 If a fish is taken from the water and put on land,under no conditions will he feel joyfulness.Similarly,we are spirit souls who somehow or other have come into contact with this material world.And because this material world is not befitting our spiritual self,here we cannot have joyfulness.The spiritual self requires spiritual joy,which is beyond these material senses.So this Krsna Consciousness movement is meant for cleansing or purifying the senses.As soon as we pourify our senses,we can actually enjoy spiritual sense pleasure.Now our senses are not being properly used because they are covered by matter.Therefore the enjoyment we are now having is simply a perverted reflection of real,spiritual enjoyment.To experience this spiritual enjoyment we must purify our senses by the process of Krsna consciousness. In the Vedic literaturesit is said,(sarvo-padhi-visirmuktam tat-paratvena nirmalam)"When we become free from the false designations pertaining to the body,we become spiritually purified. "At the present moment,on account of our ignorance of the soul,we are thinking of ourselves in relationship with this body.someone is born in India,so he is thinking,"I am an Indian." You are born in England,so you are thinking,"I am an Englishman. "Another is thinking,"I am Japanese,"and so on.But actually we are neither Indian nor English nor Japanese.We are spirit souls,part and parcel of god.Knowing that is part and parcel of god.Knowing that is self-realization.And unless we relize our self,all our activities will lead to problems and defeat.We can see that in the present civization,despite advancement of eduction,despite economic development,despite so many philosophical speculations,people are in the same problematic atmosphere as ever.Why?because the defect of the present civilization is that people do not know what they are.We are all spirit souls,and we must realize this if we want real peace and real joyfulness.Everything about self-realization is explained in Vedic literature,which is summarized in the Vedanta-sutra and balso in the Srimad-Bhagavatam.And five thousand years ago,the Lord Himself--Lord Krsna--spoke this transcendental philosophy in the Bhagavad-gita.We are publishing all these literatures,translated into English,If you want to understand this scientific,spiritual movement through philosophical speculation,we have dozen of books for you to read and understand. 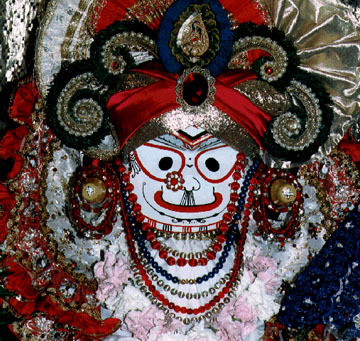 Otherwise, you can simply chant the Hare Krsna Maha Mantra.It is only sixteen words:Hare Krsna,Hare Krsna,Krsna Krsna,Hare Hare/Hare Rama,Hare Rama,Rama Rama,Hare Hare.there is no expenditure.if you chant the Hare Krsna Mantra,there is no loss on your part,nor are we charging anything.We are distributing this maha-mantra free of charge,and anyone can chant it.There is no difficulty.On the basis of this mantra we are spreading this movement all over the world--not only in your country but in the whole of America,the whole of Canada,and also in Japen,Australia,New Zealand,Africa.Everywhere.We have one hundred branches all over the world.Soour only request is that in whatever condition you may be,please try to chant these sixteen words whenever you have time.And you have time:you can chant Hare Krsna when you are walking on the street,when you are traveling on the bus,or when you are sitting alone. 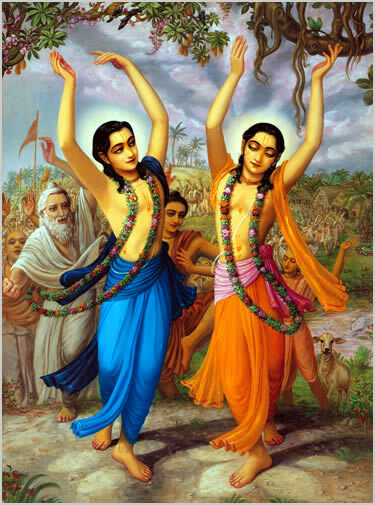 There is no loss,but the gain is is very great.Therefore our only request is that you take up the chanting of this maha-mantra--Hare Krsna,Hare Krsna,Krsna Krsna,Hare hare,Hare Rama,Hare Rama,Rama Rama,Hare hare.And we shall periodically remind you by the functions such the one we are holding today,the Ratha-yatra festival.Thhis Ratha-yatra festival is very old--at least five thousand years old.Lord Krsna,along with His elder brother,Balarama,and His sister,Subhadra,once rode in a chariot from Dvaraka to Kuruksetra,,and this festival commemorates Krsna's riding with His family on the chariot.This function is held every year in Jagannatha Puri,in India,where it is a great celebration.